SEO is the only way to gain success in the search engine rankings outside of major media attention. SEO is both a science and an art and depends on many factors to bring about equitable results. There is no set price on SEO costs and we’ll have to look at the parameters that determine how much money you should invest. Not all websites are the same. Some sites reach search engine high positions due to fame from major media. Others gain the top spot because of an exploding trend. Others hit the top because of exclusivity and others reach the top via SEO. SEO can only work after extensive realistic analysis of your site, your goals, and your resources. If your site is new, you’ll have a battle ahead but only if you don’t have a huge budget to devote to SEO. If your site is new and you don’t have a huge budget, you’ll be in for a long wait after considerable effort on your part. If you’re starting from the ground floor up and don’t have a big budget you’ll need to apply what you know about SEO. If you don’t know enough you’ll have to study. This invests time which means not making money. It will cost you money in some instances as you may have to pay for some software and services such as tutorials or attending seminars. The advantage to doing SEO on your own is that once you get the fundamentals under your belt you can gradually improve your skills and if you’re really smart you’ll equal or better the competition. This means saving money on a major scale which will make SEO far cheaper and highly rewarding. The only drawbacks are it will take a considerable amount of time on all fronts and you have to have an unending patience to succeed this way. Paying for SEO services can be expensive depending on your site’s condition and other factors. If your site is not professionally engineered nor designed, you’ll have the SEO company tell you that you’ll need to change your site in accordance to their guidelines which can take you time and cost you money especially if you’ve had a company create your website for you. An SEO company will spend time explaining things to you, however, they will not give out proprietary information. You have to pay for their specialties ones step at a time. The SEO company may have to create content for you which is going to cost. Posting that content and doing moderation of social media is another cost. Keyword research can be quite an expense as the SEO team has to dig through lots of metrics and statistics which takes time and expertise. They’ll be scouring the web and competition to see what they can and can’t do with your site. They often use expensive software to do their job and that costs. 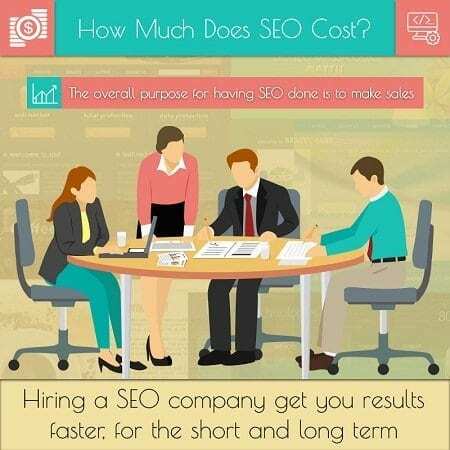 The overall benefits of hiring an SEO company are multi-fold. They will get you results faster, for the short and long term. You will have an SEO site that you can rest your laurels on at times so that you can pursue other vital actions such as drumming up more business and dealing with your customers. Add to that the overall purpose of having SEO done is to make sales. An SEO company can achieve this for you. The bottom line is that you get what you pay for or invest in. The approaches mentioned earlier are a guideline to doing things equitably so do them with your own best interest at heart.